My Peruvian 2001 trip came perilously close to getting cancelled, thanks to my nationality and my place of residence. About a month before my trip, I found out that a Peruvian visa wait time is a complicated function of the consulate, your nationality and the type of visa. An Indian requesting for a visitors visa in the LA consulate - I, by the way, fall into this category - must wait for at least 3 weeks to get his authorisation. After waiting with bated breath for 5 weeks, I finally got my visa minutes before I was all set to apply for a business visa, and more importantly, 4 days before my departure date. 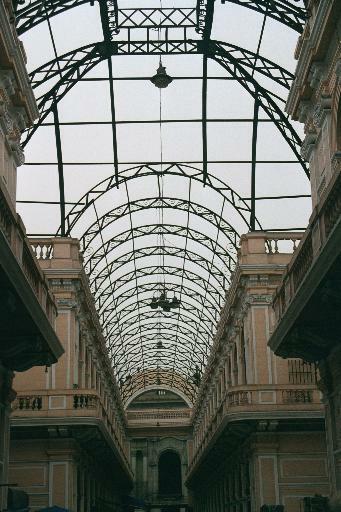 Hence when I finally landed in Lima, I was convinced that the things can only get better and for once, I wasn't wrong. Lima, named after the river Rimac, at least in winter, is always dull, gloomy and foggy making you realise why the Incas were such big sun worshippers. As most of my group members were coming from Europe and Australia, they did not arrive till the next day. I utilised the time exploring the museums in the city along with Susan, the only other person in the 15 member group from the United States. We realised that our Spanish was not upto the mark when we ended up in the country club after we had clearly told the taxi driver to take us to the Museum of Archaeology, Anthropology and History. The museum of archaeology etc., where we finally made our driver to drop us, was the first of the many places which changed my thinking that the Peruvian history is all about the Incas. 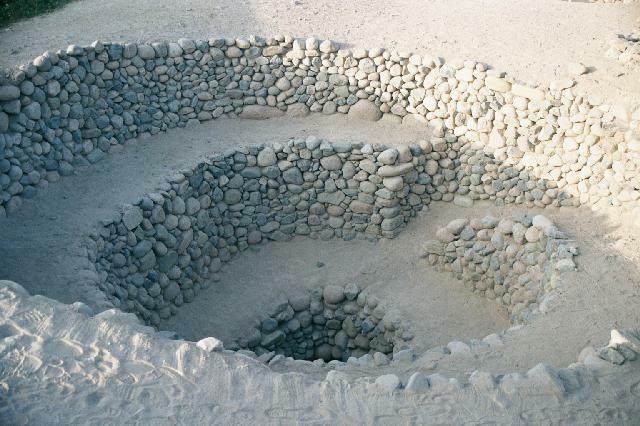 There were enough Chimu, Mochi and Wari artifacts to prove that the world did not start with the Incas. We spent the afternoon at the gold museum, a museum with an astounding private collection of gold artifacts, textiles and arms. Despite the fact that most of the stuff here are replicas - a big secret which was unearthed days after my visit - the museum is worth a visit. Among the churches, San Francisco with its huge catacombs is perhaps a must see. These catacombs are one of its kind in Peru and are comparable to the one in Rome. he following day 15 people met with each other little knowing that they are about become the part of the greatest travel group ever! With people between 21 to 63, we covered all the ages and with people from Michigan to Melbourne and Edinburgh to Chennai, we covered all the accents. The day, by the way, was spent on a whirlwind tour of the city and its National Museum. Early next morning, our trip officially started with a drive down the Pan American highway to the city of Paracas. Enroute we stopped at the ruins of Pachacamac, the creator of the earth. 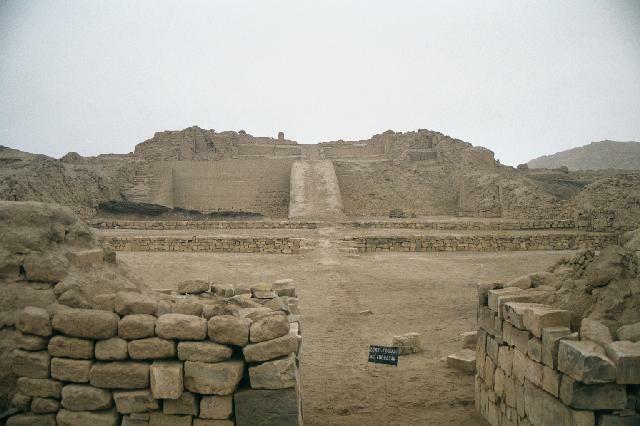 The city was built by the Limas who worshipped the two faced God, Pachacamac. The Limas were succeeded by the Waris, the snake worshipers. Worship of Pachacamac was revived by the following Ichac culture who built 17 provincial temples for their God. The door of the main temple was supposed to have been decorated with gold, silver and sea shells. Today it stands in the museum with just the sea shells. Like most other culture in Peru, Ichacs were conquered by the Incas who built a sun temple at the highest point in the city and also a moon temple which housed the virgins of the sun. The city once covered 9 sqkm, 5 of which is now taken over by residential colonies. We were told that Pachacamac is a happy God and he never cries - hence there is no rain - but shows his anger occasionally by making the earth move under our feet! 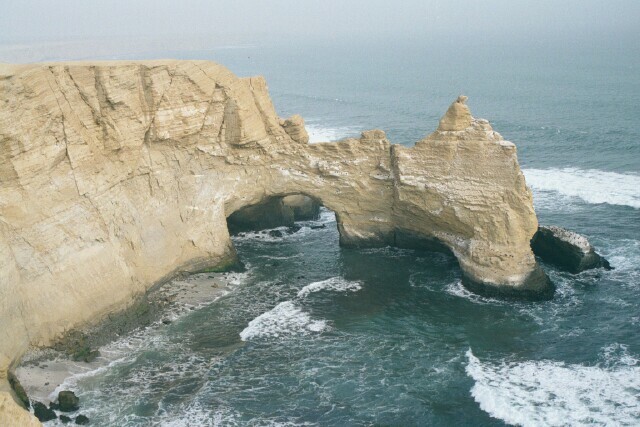 The seaside town of Paracas has a rugged coastline and a rich animal life. Simon Bolivar, the liberator of Peru, landed here in Paracas and it is said that the flamingos around this area had inspired him to put their colour in the national flag. The best place to view the marine life is the Ballestes Islands - also known as the poor man's galapagos - located a few miles off the coast of Paracas. An early morning boat ride to these islands brought us close to the seals, penguins, boobies and pelicans. It was really interesting to watch the way boobies dive into the water vertically down at high speeds to catch their prey. We were told that this repeated hitting of water surface results in blindness for most of these birds within 2/3 years. In Paracas, we also had a sneak preview of the famous Nasca lines. Etched on a dune is a figure popularly known as the candelabra. No one exactly knows who made the figure or why it is there. 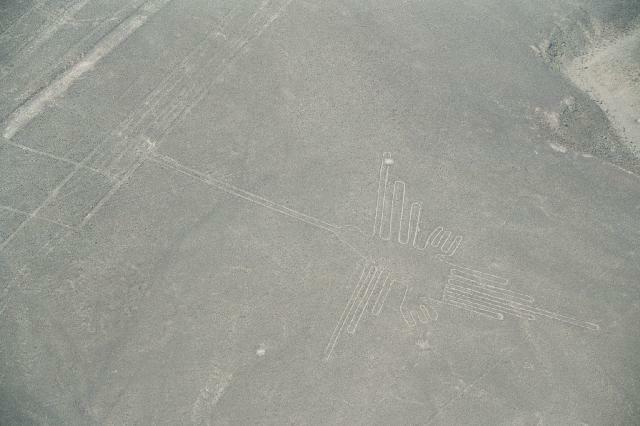 We were to see more such figures in Nasca. Few hours of drive through the arid desert brought us to Ica, a place known for its giant dunes and its skull museum. Incas used to deform the heads of their people based on their caste and we saw many of these odd shaped skulls at the museum. Some of us went for sand boarding when we had stopped for lunch at the Huacachina oasis. It was a chance for Cliff, the bloke from Down Under, to show everyone why the Aussies are considered to be good in surfing. Drive from Ica to Nasca took us past the tallest dune in the world - Cerro Blanco (2072m). We reached Nasca in the late afternoon looking forward to our flight over the lines. To our disappointment we found out that despite booking our seats in advance, the authorities had given them to another set of tourists who beat us to the post by a few minutes. We were assured of seats in the first flight next morning, but in such foggy conditions it meant a wait till 3 in the evening for the completion of the event. We spent the spare time visiting some of the still used pre-inca underground aqueducts. These aqueducts had artificial wells connecting them to the surface at regular intervals. One can go down one well and swim through the aqueduct and come up the next. No sooner did the group know about this fact that it had half its members groping in the darkness of these aqueducts. Only my chronic hydrophobia could stop me joining the fun although I did chip in by finding an ingenious method to photograph these brave people inside the aqueduct. Flight over the lines was worth the wait. The astronaut, the monkey, the humming bird and the spider were the pick of the lot. It is absolutely amazing how people could make such giant figures and how these figures could survive the test of time. I wish we knew the meaning of these figures. After the flight, which put David on top of the sick list, we drove through more spectacular desert scenery to a small seaside village of Puerto Inca. The coastal desert which extends south into the Atacama, one of the driest spots on earth, owes its existence to the cold Humboldt current. This stunning desert scenery combined with the huge cliffs overlooking the ocean made the drive along the Pan American highway seem much more scenic than its counterpart in N. America. The lodge at Puerto Inca is situated close to some lesser known Inca ruins which we were forced to explore in darkness, thanks to our flight schedule at Nasca. That night was special because it was the 22nd birthday of the youngest member of the group, Juliet. Celebrations that night earned the group the title of "noisy" from our neighbours and earned Val the title of "Super", as she stayed up almost the entire night to prove a point to the nocturnal sub-group of Matt, James and Mike. Our final day in the desert started off very early in order to give us every chance to find our way through the earthquake hit parts of the Pan American highway to the city of Arequipa. The road in parts was one-way with a half of it either collapsed or under rubble due to the previous months quake. We finally managed to reach Arequipa in the late afternoon giving us a bit of time to catch up with our sleep. Click here to see photos taken in Lima. Click here for photos taken in Paracas and Ica.